So I have a UV lamp but haven’t used many UV Gel products so I was interested to try out the ‘Chameleon Sequins Gel BP-08‘ that BornPrettyStore sent to me to review. There’s only 3g of gel in the little tub which doesn’t look much at first but actually there’s plenty. I started off with a black base then applied two coats of the gel, curing in between. For application I used a small flat brush as I felt it would pick up the Chameleon sequins better than a pointed brush. Even though it’s described as ‘sequins’, I’d probably call it a chameleon flakie. It really is beautiful and it was worth doing two coats of gel as I think it helps add a bit of depth. I sealed in all in with a no wipe UV gel top coat. As pretty as it is alone, I thought it made a fitting base for some basic galaxy decoration. What do yous think? 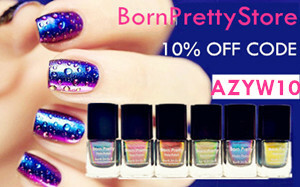 If you would like to order this Gel or anything else from BornPrettyStore feel free to use my code AZYW10 at the check out to receive 10% off all your full priced items.